The William Penn Award is the highest honor bestowed upon a business person in the Greater Philadelphia business community. Each spring, recipients are chosen for their outstanding contributions toward the betterment of the region, their professional accomplishments, and their commitment to charity as well as to the community. This formal dinner-dance and networking reception welcomes regional business leaders as they pay tribute to the recipient. Since becoming president of the University of Pennsylvania in 2004, Amy Gutmann has been widely recognized for her transformative leadership, including increasing Penn’s diversity, interdisciplinary excellence, innovation ecosystem, and civic engagement both locally and globally. The first in her family to graduate college, Dr. Gutmann has made access to a Penn education a top priority. She has more than doubled the number of students from low-income, middle-income, and first-generation college families at Penn. Under her leadership, Penn is the nation’s largest university offering all-grant financial aid that meets the full need of undergraduate students, three quarters of whom graduate debt-free. Dr. Gutmann leads a preeminent healthcare system, featuring a premier medical school, the Perelman School of Medicine, and six major hospitals. As Philadelphia’s largest private employer and healthcare provider, Penn has an economic impact of $10 billion in the city of Philadelphia and $14 billion annually in Pennsylvania. With more than $1 billion in sponsored research annually, Penn is an economic powerhouse for Philadelphia and the surrounding region. Dr. Gutmann has continued her award-winning scholarship and pathbreaking public service. Her seventeenth book, Everybody Wants to Go to Heaven but Nobody Wants to Die: Bioethics and the Transformation of American Healthcare (with Jonathan D. Moreno) will be published in 2019 by W.W. Norton. President Barack Obama selected her to chair the Presidential Commission for the Study of Bioethical Issues from 2009-17. The Commission published ten major reports on important issues of science and healthcare. 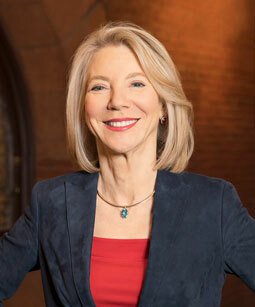 Before her appointment at Penn in 2004, Dr. Gutmann was the Provost and the Laurance S. Rockefeller University Professor at Princeton University, where she also served as founding director of the University Center for Human Values, dean of the faculty, and senior advisor to the president.